Wish is a top rated online shopping app that allows you to buy premium looking products at a great price. It makes shopping fun for the user. About 60 to 65% of products listed on Wish are manufactured in China. China is a country where premium looking products are sold for throw-away or wholesale prices. A bunch of developers decided to take advantage of the wholesale Chinese markets and launched a website called Wish. Wish allows users to buy watches, gadgets, fashion items such as clothing, wallets, bags at dirt cheap price tag. It has turned out to be a very successful concept. Millions of people visit the Wish site and use its Android/iPhone app daily. Before you begin shopping on Wish, you must create a free account. You can also login to the site/app with a Google or Facebook account and start shopping. Once you log in, Wish Shopping Made Fun shows trending items on its homepage. It also provides a menu bar with which users can filter products. Alibaba group owns several popular shopping portals. One of its most widely accessed services/apps is AliExpress. This app organizes special sale wherein it sells products for dirt cheap prices. It has a search tool to find items quickly. Aliexpress ships over 70% of its products free of cost to every part of the world. Like Wish, payments made through AliExpress app or website is secure. AE offers ticket based support and has live chat service through which customers can get information about shipping or seek help from the customer support executives. In case your product isn’t shipped by the seller or doesn’t reach your doorstep, you can apply for a refund. Aliexpres supports various currencies and over 9 languages. The excellent rating of 4.4 from over 10 million users prove that AliExpress is one of the best apps like Wish. BG is yet another popular shopping app like Wish. It is also a good alternative to AliExpress. BG enables you to buy accessories for IOS devices, gadgets, electronic items such as cameras, walkie-talkies, earphones, MP3 players, etc. Banggood has a massive listing of over 50000 products. It allows you to see top selling products. 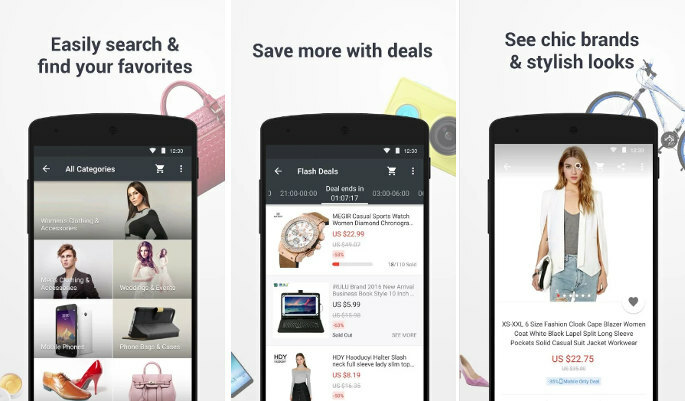 The app features a flash deals section where you can purchase hot products at a great discount. 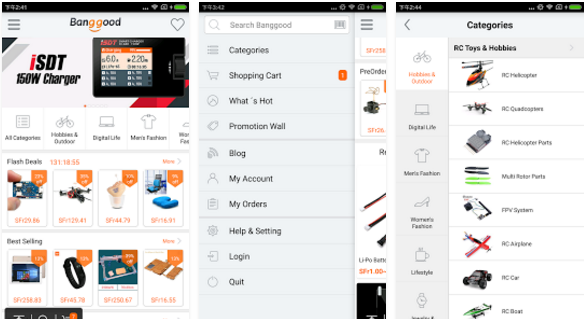 Like Aliexpress and Wish Shopping Made Fun app, BG lets you track the status of your order. BG has a wishlist feature, with which you can shortlist items for buying them later. The app allows users to write reviews of the products they purchase. It supports payments via PayPal and has dedicated support teams to help you out with delivery or quality issues. Impressed with the price and features of Chinese gadgets and mobile devices? 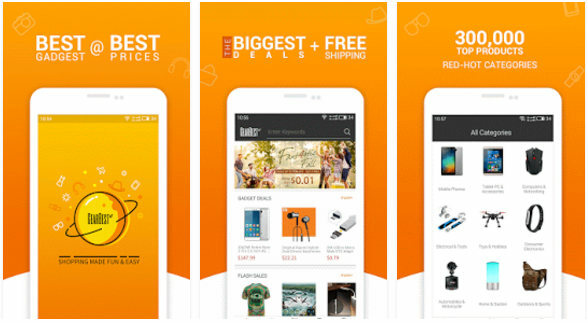 Download the GearBest app. GB is an online marketplace where you can buy consumer electronics and gadgets. It has an impressive listing of over 100K high-quality products grouped into 100+ categories. The app lets you buy RC drones, mobile phone accessories, wearable devices, tablets, and more similar stuff. Like Banggood, GearBest accepts payment made with PayPal. It features a favorite list module through which you can bookmark/shortlist items and track their pricing. GB lets users read and post reviews. It has the option to track and manage orders. Orders placed through GearBest app are shipped free of cost. 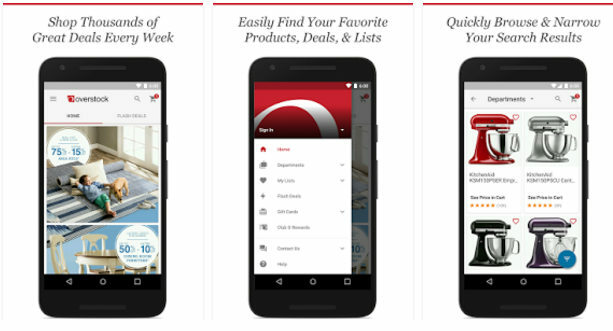 If you’re in the US and want to buy high-quality stuff without spending 1000s of dollars, then install and use Overstock. OS offers up to 70% off on costly items such as furniture, electronics, jewelry, watches, etc. It has a smart notification system that keeps users updated about the latest discounts and sales. It supports Android Pay payment system and includes a dedicated interface for the hottest deals. Overstock offers free shipping for items having a minimum $45 price tag. 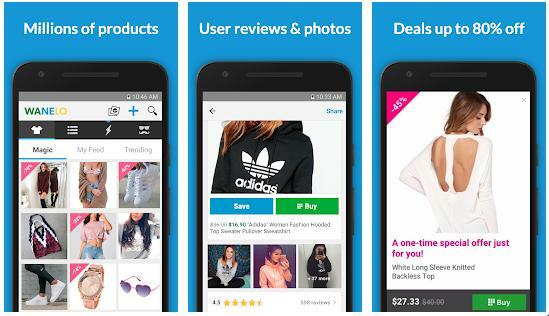 Wanelo is a lightweight shopping app like Wish that allows you to buy a variety of products online. It has 1000K users. It features a recommended product section where you’ll find new items every day. Wanelo provides a search option. It allows you to browse stores that sell clothes, shoes, gadgets and many more products for cheap. It gives you access to items from top brands. Conclusion: Wish is a beautiful app that makes finding the best deals easy. In case you’re having some issues with it or you’re unable to find your item, download and install the above apps that are similar to Wish. The above applications deliver a similar shopping experience like Wish. They are lightweight and secure.